Human Data Interaction (HDI) is an emerging field of research that seeks to support end-users in the day-to-day management of their personal digital data. This is a programmatic paper that seeks to elaborate foundational challenges that face HDI from an interactional perspective. 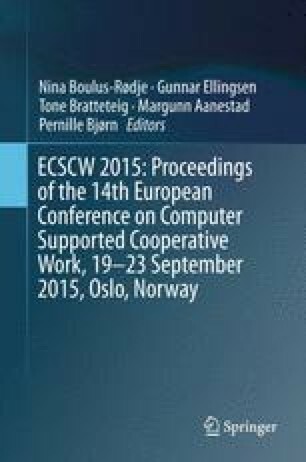 It is rooted in and reflects foundational lessons from social studies of science that have had a formative impact on CSCW, and core challenges involved in supporting interaction/collaboration from within the field of CSCW itself. These are drawn upon to elaborate the inherently social and relational character of data and the challenges this poses for the ongoing development of HDI, particularly with respect to the ‘articulation’ of personal data. Our aim in doing this is not to present solutions to the challenges of HDI but to articulate core problems that confront this fledgling field as it moves from nascent concept to find a place in the interactional milieu of everyday life and particular research challenges that accompany it. The research on which this article is based was funded by RCUK research grants EP/M001636/1 and EP/K003569/1. 14/EN WP223. (2014). Opinion 8/2014 on recent developments on the internet of things. Article 29 Data Protection Working Party, http://ec.europa.eu/justice/data-protection/article-29/documentation/opinion-recommendation/files/2014/wp223_en.pdf. Elmqvist, N. (2011). Embodied human-data interaction. Proceedings of the SIGCHI Conference on Human Factors in Computing Systems. Workshop on Embodied Interaction: Theory and Practice in HCI. Vancouver: ACM. Retrieved July 9, 2015 from http://www.antle.iat.sfu.ca/chi2011_EmbodiedWorkshop/Papers/NiklasElmqvist_CHI11EIWkshp_EmbodiedHuman-DataInteraction.pdf. Haddadi, H., Mortier, R., MaAuley, D. & Crowcroft, J. (2013). Human data interaction. Cambridge: Cambridge Computer Laboratory. www.cl.cam.ac.uk/techreports/UCAM-CL-TR-837.pdf. Haddadi, H. et al. (2015). Personal data: Thinking inside the box, Computing research repository, http://arxiv.org/abs/1501.04737. Mashhadi, A., Kawsar, F. & Acer, U. (unpub. manu.). Human data interaction in the IoT. Bell Laboratories. www.fahim-kawsar.net/papers/Mashhadi.WF-IoT2014-Camera.pdf. Pentland, A. (2012). Reinventing society in the wake of big data. Edge, August 30 2012. http://edge.org/conversation/reinventing-society-in-the-wake-of-big-data.